Since I was a kid, I always enjoyed cashew nuts, but I had no clue they came with health benefits for a growing body. Among my siblings and parents, my mom and I enjoyed the delicacies offered by both salted and unsalted cashew nuts, while my sister and father were allergic to the fruit nut. Despite all the cashew nutrition facts and benefits, you can find online, some Americans just do not care for it. Not only is it bigger than your average peanut, it is also tastier and packs more calories. The many ways you can eat the nut that is derived from the cashew tree is only limited by your imagination. It is not uncommon for people to turn it into nut butter or milk, while others will take pleasure in adding the nut to stir-fry dishes or vegetable salads. Before we get to the most obvious cashew nuts nutrition, it is quite appropriate to give a brief historical background about this mysterious fruit nut. First of all, the nut that is shaped like a kidney is derived from the bottom of the fruit that is found on a cashew tree. 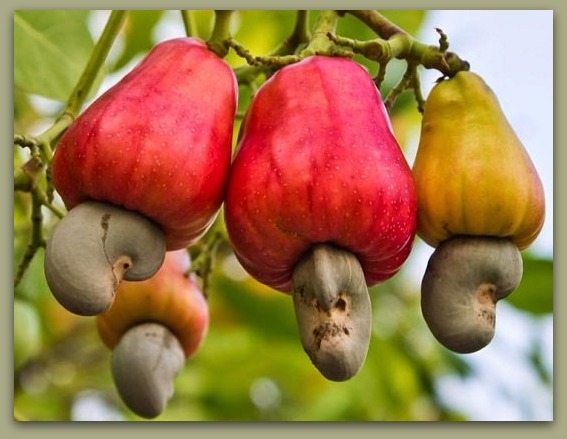 The fruit is actually called cashew apple and the nut grows out of the bottom of it. Originally, the cashew tree was found in abundance in the northeastern part of Brazil, which is a coastal area. Nowadays, this tree can be found in great quantities in many African countries, Indonesia, Vietnam, and India. Asking how it got to other countries might elicit different answers, which makes it quite difficult to explain how the cashew tree was transplanted from one part of the world to another. The nut itself is always covered by a solid shell that also contains caustic resins, which is poisonous if not handled the right way. The resin is also known as cashew balm and must be removed before the nut can be consumed. The scientific name for cashew is Anacardium occidentale, which is part of the same family like pistachio and mango. Even the so-called raw cashew nuts that you can find online are boiled to remove the toxic resin before it is fit for consumption. The caustic resin that covers the cashew nut is now popularly used for making insecticides, varnishes, and other products. Since the nut is derived from the cashew tree it can be considered a fruit rather than a nut. The cashew apple fruit that holds the nut is actually an edible fruit that is very sweet. You’ll not find it in your local grocery store or supermarket due to its short shelf life, which makes it quite hard to transport from the growing area. While cashew nuts can provide your body protein and fats it is also loaded with high calories, and it is not uncommon for an ounce to pack from 100 to 150 calories. Whether you’re eating the raw or roasted version of cashew nuts there are health benefits you should be aware of. Some, in my opinion, cannot be adequately supported by scientific facts, but many others are quite true. The most obvious health benefit attributed to cashew nuts can be traced to the Proanthocyanidins in its structure, which is a form of flavonols. It is also true there is a high concentration of natural copper within the cashew nut, which means both ingredients give it the ability to fight cancer cells, especially the ones that can afflict the colon part of your body. While this benefit is highly promoted by most cashew nut brands, you should stick to the unsalted variety as it tends to come with more of the natural nutrients. Most nuts are good for your heart, but cashew nut is even better for your heart health since it comes with a lower fat content. The fat found inside cashew nuts is cholesterol free and also loaded with needed antioxidants that can help your body fight off heart diseases. It is said that eating cashew nuts on a regular basis can help reduce your blood pressure. I do eat about 15 to 20 ounces of cashew nuts on a weekly basis and my blood pressure is quite low. This health benefit claim is made because of the presence of magnesium within this nut from the cashew apple fruit. Do keep in mind that magnesium is also helpful in promoting healthier bones. Will I attribute my lower blood pressure levels to eating cashew nuts on a regular basis, probably not, but it does help. The key to lower blood pressure is sensible dieting and staying away from the consumption of intoxicants. The natural copper ingredients present inside cashew nuts give it the ability to help with the growth of stronger and healthier hair follicles. I find this benefit hard to justify since I am bald, but my buddy that also consumes cashew nuts do have hair growth that is healthy and beautiful to look at. Above are the only benefits that make sense to me, and I consume cashew nuts on a daily basis. Any other benefit that is attributed to this nut must be carefully examined, but never forget to use your own internal common sense to reach your own conclusions. Like everything that is good for you too much can create unwanted side effects. While it is far healthier to use cashew nuts as your favorite snack, too much of it can create lasting side-effects you should be on the lookout for. If you consume the salted kind, you run the risk of increasing your sodium intake due to the salt. My advice is to stick to the unsalted roasted cashew nuts, you’ll find them to be tastier, and will not increase your sodium intake. Can eating too much cashew nuts lead to weight gain? That will depend on your lifestyle choices. You should know that an ounce of cashew nut can pack over 100 calories not counting the sodium content if you’re eating the salted variety. Do stay away from the cashew nuts that come with different type of flavorings, because those will certainly make you gain weight faster. The cashew nuts sold as raw does not represent the true meaning of the word. The raw version of cashew nuts has been slightly boiled to remove the dangerous caustic resin attached to it. If you happen to end up at a cashew tree farm you should know that consumption of the cashew nut with the shell can lead to deadly health consequences. It is true that some people are allergic to eating cashew nuts. Within our household growing up, my father and sister will get skin rashes from just eating a few nuts from the cashew tree, while my mother and I would not. The so-called allergic reaction to eating cashew nuts is different from person to person, which means you should eat a few of the nuts and see what happens before buying in bulk. Over the years, I have tried different brands of cashew nuts and the brands reviewed below I have personally tasted. 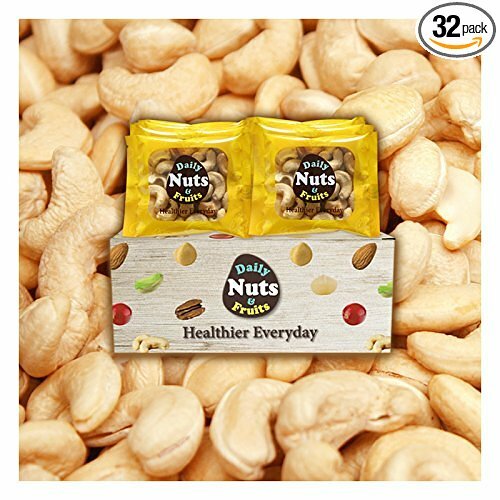 The products reviewed below I found to be delicious and comes with all the health benefits one can get from eating cashew nuts on a regular basis. 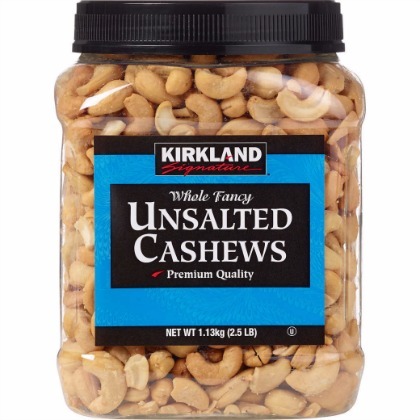 Kirkland brand is owned by Costco and used to be my favorite unsalted cashew nuts when I paid the membership fee. Personally, I detest paying a fee for the privilege of spending my own money, but I do understand the clever marketing technique behind the idea. Why pay the membership fee when you can buy this cashew nuts from Amazon at almost the same price. I have always found the unsalted cashews from Kirkland Signature brands to be fresh and delicious. The only problem you might have with the two-pound packaging might be eating it too fast. The nuts they used to make this product are definitely of higher quality, based on my experience. What a name for a brand? I bought this brand to keep track of the number of cashew nuts I ate on a daily basis. I like the fact that it is packaged in one-ounce small bags and you’ll find 32 of them in this order. It is not only salt-free, but also free of GMOs, artificial flavors, preservatives, or gluten. I find it is the right cashew nut brand to use if you have little ones in the house. I take one or two bags with me on my way to work and have introduced several co-workers to the brand rather than sharing mine. The manufacturer claims each pack contains only 100 calories. The name Planters is forever etched into my subconscious from all the clever and funny television commercials I watched growing up. Yes, they also make whole cashews, and this happens to be the top-selling roasted and salted cashews on online. While I am not a fan of salted cashews, I have bought this brand a few times while waiting for my order to arrive. In my opinion, the addition of salt does change the taste of the cashews but is is a good source of fiber, protein, and other healthy nutrients. 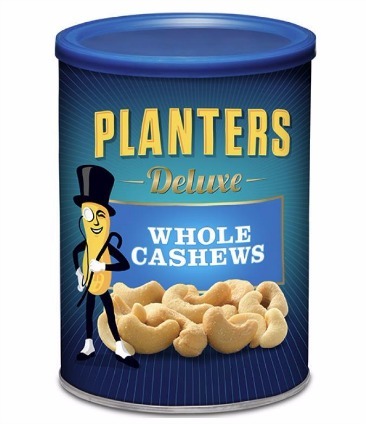 Unlike the cashews that come in plastic containers, the Planters deluxe whole cashew nuts come in a metal container, which makes it easier to close after a few bites of the snack. If you like your cashews salted, this is the brand I would suggest you try out. If you like your cashew nuts raw this brand comes with the right taste that you would love. The nuts used to make this product is derived using fair trade practices and comes with the latest USDA certification. 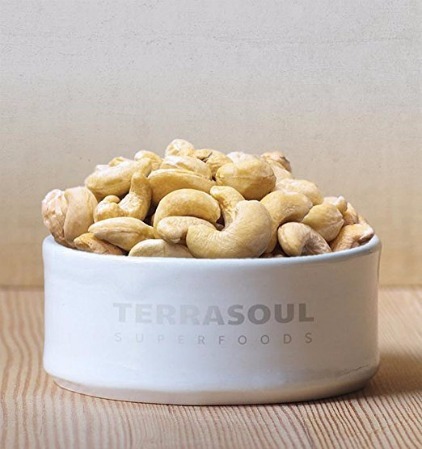 Your purchase of this cashew nuts made by Terrasoul Superfoods comes with a thirty-day money back guarantee. It is the right brand to use if you’re trying to make nut milk out of it. This used to be my favorite brand until they ran out of stock for several weeks last year. I probably will go back once I finish my current stock of delicious roasted cashew nuts. 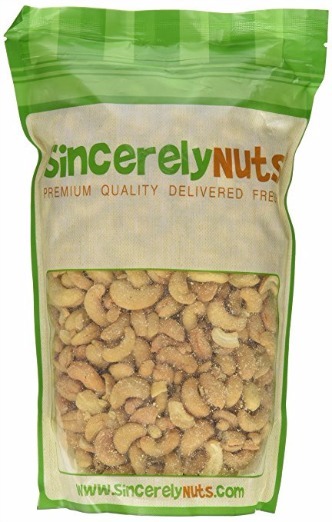 The Sincerely nuts cashews are roasted but unsalted. I have always enjoyed the even taste of the nut right to the last one in the bag. The cashew nuts from Sincerely Nuts are free of genetically modified organisms and certified kosher. While it is advisable to eat few of the cashew nuts on a daily basis, too much might cause weight gain. The packaging for this product is simple and yet effective at keeping the nut fresh over a long period of time. 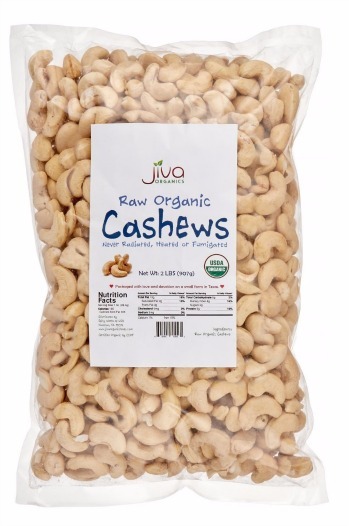 If you enjoy your cashew raw, which means it is not roasted or salted, the product from an outfit called Jiva Organics would do just fine. My first taste of the Jiva organics raw cashew was at a friend’s home warming celebration. This friend is into healthy organic snacks like no other person I know. This product is certified organic by the USDA, and free of genetically modified organisms (GMO). The fact that it is raw and gluten free, makes it one of the most natural vegan-friendly cashew nuts one can purchase online.